Want to create a culture that embraces creative feedback? Start with shared agreements. - darbyDarnit! Want to create a culture that embraces creative feedback? Start with shared agreements. Houston branding expert Robin Tooms recently shared this Fast Company article on LinkedIn and I found it rich with great advice on how to better deliver and accept feedback on creative work. 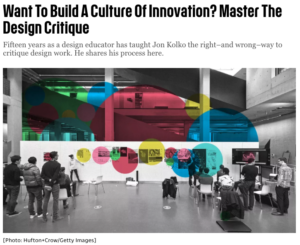 The article is great for teams looking to hone their process and comfort level in the creative feedback loop – a critical aspect of maximizing the effectiveness of creative productivity and improving the quality of products and campaigns. But what happens if your team does not fully embrace the importance, the necessity, of receiving creative feedback? What happens if they don’t yet realize their voice is essential to contributing to the development of others’ creative work? The execution part of feedback will fall short, create contempt, and drive your team apart instead of bonding them together in a common cause. So what’s needed? For our team it was a set of shared agreements, core values, or principles that shape our why, how we operate as a team, and our individual roles in that collective. When I was recruiting for the Raise Your Hand Texas marketing, communications, and creative team, I told candidates the goal was to develop what I called “The Pixar for Public Education” – the best damn narrative storytellers for strengthening and improving public education in all the land. Each team member was inspired by that moniker and put their full heart and soul into reaching that potential. But it was evident early on that sometimes we approached our efforts in silos, and responded to well-intended criticism and suggestions with defensiveness and protectionism. We treated work as though it were ours, and ours alone. And when you represent a brand, that is never the case. Pixar was a perfect model for how to address this. They assign one person to serve as the owner of a work product, but make it clear others will participate at various stages of ideation, planning, pre-production, production, and post-production. Those people’s jobs are to evaluate and respond to what is working, what is not, and what can be done about it. Sometimes the creative owner requests very specific feedback. Other times, the team may either share what they think is not working and let the owner figure out ways to address those items, or share what is not working and give the owner a portfolio of options that can solve the issues. Then it is up to the owner to try and find the best path forward. I realized our team did not yet share this commitment to our roles as individuals and as a team, and how that should play out in everything we do. So I started by offering up a few principles I gleaned from what I knew about Pixar, some from videos and articles, some from Ed Catmull’s Creativity Inc. (a brilliant read for anyone leading or on a creative team), and invited our team to add and edit with the goal of formalizing our value, our values, and our operating code. Our team consists of smart, passionate, creative professionals who care about changing lives through compelling storytelling. We are committed to excellence in storytelling, every time. To continual improvement. And to always pushing the boundaries of great storytelling. None of us have it all figured out. We are all in this together. Our best work results from drawing on the collective talent, knowledge, and experience of the team. And all of our work is a reflection of the entire team’s contributions. The trust we have as a team informs how we operate and allows us to be vulnerable and open. Sharing unfinished work in progress liberates us to take great risks and try new things. Candor is critical in providing actionable feedback that enhances the ultimate product. We are not our work. Feedback is intended to create the best possible outcome, not criticize the originator. The first five bullets were designed to set the foundation for why creative feedback and teamwork is crucial. The next two are very specific to what we believe makes creative work even better: sharing work in progress and candor. And the final bullet is designed to reduce the personal attachment to creative work product. Note: “reduce” does not equal “remove.” Anyone who has led or worked on a creative team knows creative work is always personal. Even those creatives with decades of experience in the marketing realm still see themselves as tortured artists bearing their soul through their work, and sharing work – especially work in progress – is extreme torture. Yet, creatives also can find great relief and comfort when they bring others into their process, lightening the personal burden and finding a path forward together. Did this eliminate all friction in our creative feedback process? Not at all. Asking for feedback can be unnerving. Delivering clear and strategic feedback takes practice. And embracing challenges to your work often is uncomfortable. But contributing to and agreeing to this list of values committed us to being equal stewards in the practice of seeking, delivering, and embracing feedback. It gave everyone permission, and the responsibility, to participate in that process. And it established a foundation for the recommendations in the article above to be successful.